When will be The Man Show next episode air date? Is The Man Show renewed or cancelled? Where to countdown The Man Show air dates? Is The Man Show worth watching? The Man Show was a half hour comedy television show on Comedy Central. It was created in 1999 by its two original co-hosts, Jimmy Kimmel and Adam Carolla, and their executive producer Daniel Kellison. The show celebrated the male perspective in a sexually charged, humorous light. The show consisted of a variety of pre-recorded comedy sketches and live in-studio events, usually requiring audience participation. The Man Show is particularly well-known for its buxom female models, the "Juggy Dance Squad", who would dance in themed, revealing costumes at the opening of every show, and in the aisles of the audience just before the show went to commercial break. The first year of the show featured beer-guzzling entertainer Bill "The Fox" Foster as the show's emcee. The Fox specialized in chugging two beers in record time (sometimes while suspended upside down) and singing lewd drinking songs. He would close every episode by leading the audience in the German drinking toast "Ziggy socky, ziggy socky, hoi hoi hoi", a tradition that continued after his death in 2000. In 2003, Kimmel and Carolla left the show and the job of hosting was passed down to Fear Factor host Joe Rogan and comedian Doug Stanhope. 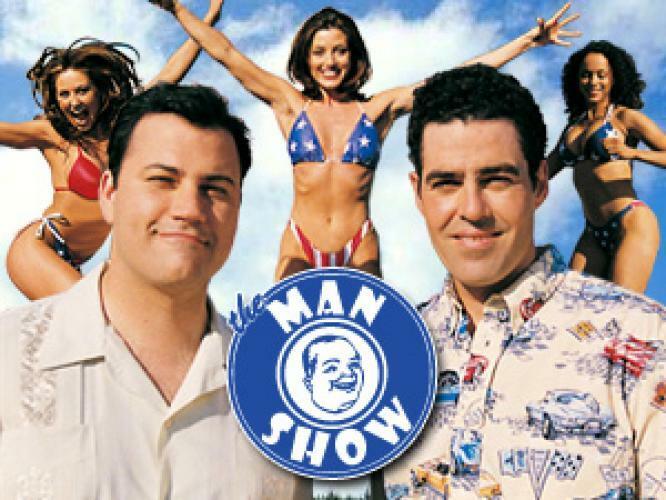 Whereas the The Man Show struck a successful balance between celebrating masculinity and lightheartedly mocking machismo during the Kimmel-Carolla era, under Rogan and Stanhope it lost its luster with most fans, leading to its eventual cancellation. Kimmel and Carolla have since gone on to helm their own respective late night talk shows (Jimmy Kimmel Live on ABC and Too Late with Adam Carolla on Comedy Central). Reruns of the show are currently airing on G4TV weeknights at 10:00 PM EST and 10:30 PM EST and on Saturdays at 12:00 AM EST. None of the Rogan-Stanhope era episodes are currently shown and the commercials referred to the syndicated episodes as "the way Jimmy and Adam made it." EpisoDate.com is your TV show guide to Countdown The Man Show Episode Air Dates and to stay in touch with The Man Show next episode Air Date and your others favorite TV Shows. Add the shows you like to a "Watchlist" and let the site take it from there.